The LG 55EA9800 is a sure-shot jaw dropper when it comes to aesthetics and image quality. There was a lot of speculation about how good or utterly useless curved TVs are and we had also given our opinion on the same. But as always, we believe only in what we see and so we got our hands on the recently-launched 55-inch curved OLED TV from LG. Here is an in-depth look at the performance and picture quality. First and foremost, the LG 55EA9800 is ridiculously thin - just 4.3 mm, that’s it. Its thinner than a pencil. The design is so refreshing and palpable that we spent a good five minutes just admiring it. The OLED factor managed to please even the most discerning aesthetic critics in our office. The sleek OLED panel is mounted on a strengthened carbon fibre frame which makes it very stable. Now, it is stable for sure, but the extreme thinness of the TV might lead you to believe that the TV is not firmly built. The TV frame is so thin that you can actually bend it slightly with just two fingers. Surprisingly our first impression was that the TV felt slight heavier than expected given its thinness. Furthermore, the entire frame sits on a transparent stand that looks like it is made of acrylic or plastic. It is this curved acrylic base that actually accentuates the curved form factor. The speakers are built into the base, which looks very cool considering it's a transparent base. The speakers proudly flaunt their name as Clear Speakers, which indeed they are. We'll see how they perform later in the review. 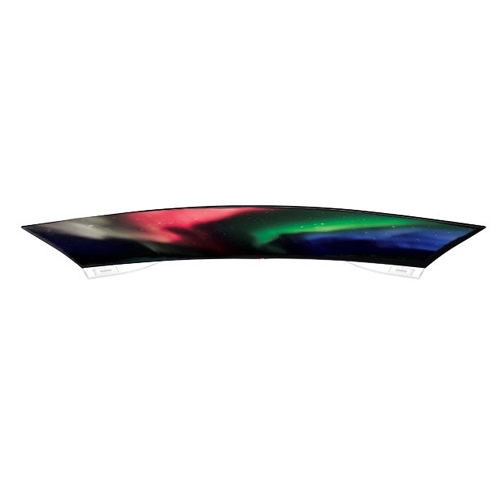 All-in-all, the curved OLED TV is a complete stunner in terms of looks and should definitely be your choice if exemplary aesthetic value is what you are looking for. This is not only the first curved TV to come to Indian shores, but also the first OLED TV. OLED (Organic LED) is not a new concept for the average video enthusiast. And for those who don’t know, it was made available in early 2013. It is a type of display technology that makes it possible to create slimmer TV sets than is possible with LCD and plasma panels. It's also more power-efficient and thus eco-friendly. An organic, carbon-based film is placed between two conductors and an electrical current is passed through, which causes it to emit light. This differs from LCD TVs, which require a backlight to create their brightness. OLED pixels are self-emissive and generate their own light. There are two types of OLED technology - Passive-Matrix (PMOLED) and Active-Matrix (AMOLED). Active-Matrix requires electronics to switch each pixel on or off individually, which is better for displaying motion and therefore the type used in OLED TVs. If you have a doubt about why should one use an OLED TV then the very first answer would be that OLED sets are lighter and thinner than LCD due to the lack of a backlight. But an even important and a better reason is picture quality. Because OLED pixels emit light directly, viewing angles are much wider, plus colour and contrast stay the same from as far as 90 degrees off-centre. Also, because each pixel can be turned off individually, OLED TVs can deliver an absolute black and infinite contrast ratio – the Holy Grail for picture purists everywhere. OLED pictures are also brighter and achieve response times of less than 0.01ms, which practically eliminates motion blur. As far as the curved part is concerned, the concept comes particularly from IMAX theatres where the screen is curved in the centre to mitigate the aberration seen on the edges of the giant screen. Before coming to TVs, the idea of a curved screen was first used in high-end home theatres. Frankly speaking we don’t feel the need for curvature in a TV per se, as however big the TV there will be no aberration seen. It would have been a different case if we were still using CRT sets. But with flat panels the idea of a curved TV seems only like a gimmick. One aspect that we are still hopeful about is that of an increased field of view in case of curved TVs. We'll look at that in our next section. 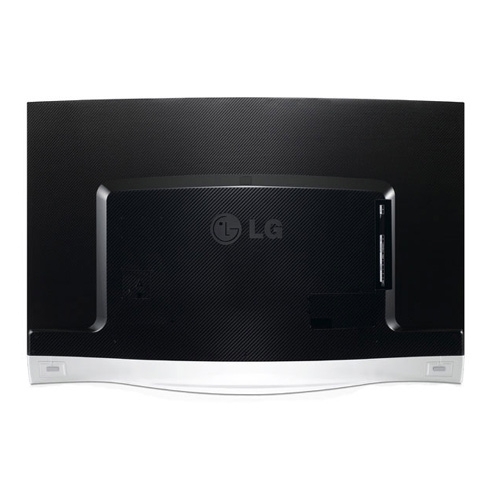 LG has incorporated their tried and tested FPR 3D technology. The TV does not come with a flurry of accessories, which might disappoint some of you, particularly for the price that they are asking for it. As for those who are not that demanding, the accessory box contains a pair of really stylish 3D glasses, specially designed by Alain Mikli. And they have also provided the clamp-on 3D glass attachment for users who wear spectacles and are not really ready or able to part with them. All input and output ports are found on the backside of the TV. The TV has 4 HDMI ports and even some of the old analogue inputs like composite and component video. In terms of controls there is a neat touch control arrangement on the TV which is activated only when you touch it. Once you do that a neat round dial comes up on the centre-bottom of the screen and prompts you to take action as required. We must say that we were pretty impressed with colour rendition on the 55EA9800. The images look absolutely stunning due to impressive, vivid, and accurate colours and amazing contrast. The black colour is tremendously deep and well-defined, which also means that other colours look extremely vivid and rich. When compared to the otherwise available standard LCD panel in a dark room, the OLED panel will definitely stand out by leaps and bounds. Furthermore the viewing angles on this LG’s OLED TV are extremely wide. Colours maintain intensity even from extreme angles, and the same is true for contrast. Only very tiny colour deviations occur, but you have to look extremely hard to notice them. Black is still pitch black when looking at the TV from the side. The 3D rendition was also perfect and immaculate in all senses, be it colour, contrast or separation. It was interesting to notice that, once you sit down and start watching a movie you rarely notice that the panel is curved, but it becomes apparent when sitting or standing above the panel. In fact, we saw no real advantages of a curved panel, at least not on this relatively small 55-inch panel. Even while watching 3D content, where the field of view factor should have been the most evident, the curvature was an outright disappointment. There was practically no sense of an increase in the depth of field and also the field of view was the same experience. LG’s "Clear Speaker” implementation is unique, and so is the sound coming out of it. We have to understand that the speaker technology in thin TVs is still limited due to the extremely slim profile. Though we could not complaint about the sound of this TV, we would not want to praise it too much either. In our humble opinion, the speakers are around average or slightly above average compared to the general TV market, but if you want proper sound you need to connect a soundbar or real speakers. The speakers deliver a bit more than you would expect by just looking at the physical implementation, but we still recommend separate speakers for anything but casual use. 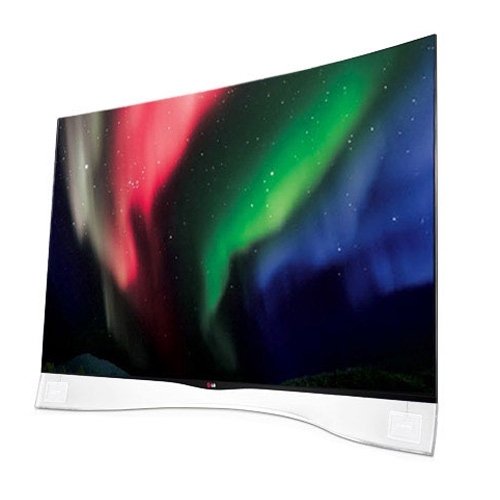 LG’s curved OLED TV looks impressive. No matter how we feel about the curved panel, we were definitely amazed by how thin and impressive the TV is in terms of picture quality. It can reproduce perfect black, vivid colours and it also has a very wide viewing angle. And even after being so thin, the TV still packs all of the same features of LG’s other 2013 TVs, including the Smart TV platform with TV apps. But we would still suggest you to hold back from going for this TV as the premium that you pay for the curve and OLED is quite substantial. A regular Full HD TV from LG with all similar features comes for around Rs 3,00,000 where as here, you're paying Rs 9,90,000. However, if you are someone for whom this price is comfortable, then the 55EA9800 is a sure-shot jaw-dropper, one that will make you redo your living room to match its aesthetics. 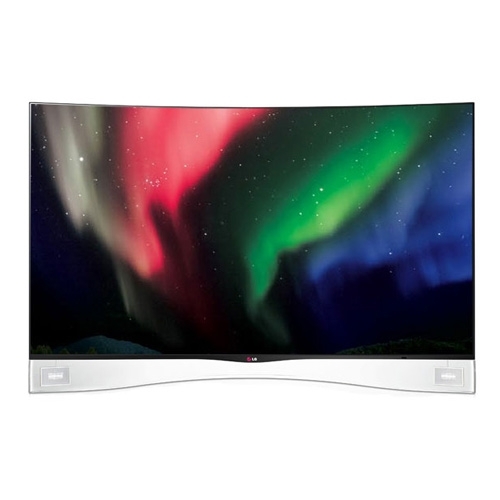 World\'s First Curved OLED TV: CURVED OLED TV The world’s first curved screen by LG heralds a new paradigm of display shape and quality, leading a transition from the flat screen to the curved. The gently curved screen is the most optimal form for any display, providing equal distance from all parts of the screen to the eyes. Previous-modes of display have been restricted by technical constraints, and catered to the machine rather than the viewer. From the first round television sets to the flat screen displays, all have never attempted ergonomical design for human comfort. At last, with a shape that is most natural for comfortable and immersive viewing, a true human experience is made possible by LG OLED TV. Paper Slim: The OLED TV is no longer restrained by the angle at which it is viewed, unlike previous devices that experience contrast loss from the sides, it shows incredibly consistent contrast from anywhere. On top distortions either. of this, LG OLED TV with its color refiner has virtually perfected the technology by ensuring no color distortions either. Enjoy perfectly wide viewing angle with no distortion of contrast or color with LG OLED TV, the perfect display all around. Infinite Contrast: LG OLED TV has finally achieved perfect contrast, a realm previously unattainable by ordinary television. The independently lighted pixels do not require a common lamp or medium, and thus are completely independent from each other. This has enabled the pixels to control their own luminance, so true depth and tone can now be produced. Images are now as alive as life, since the contrast ratio is well beyond conventional measurement.